The New Fantastic Four. 2010. Gouache and acrylic on bristol board, 11 × 17″. Folks, I am back! But I am extremely busy. So I may just keep the blog schedule at 1 or 2 posts per week for the foreseeable future. Although I am sharing Daredevil artistic duties with Marcos Martin, I'm up to bat first, which means penciling a book every five weeks for a few months. That pace would be impossible for me were it not for my Dad, who will be "assisting" me on inks. I'm about halfway through the first issue and loving Mark Waid's script. 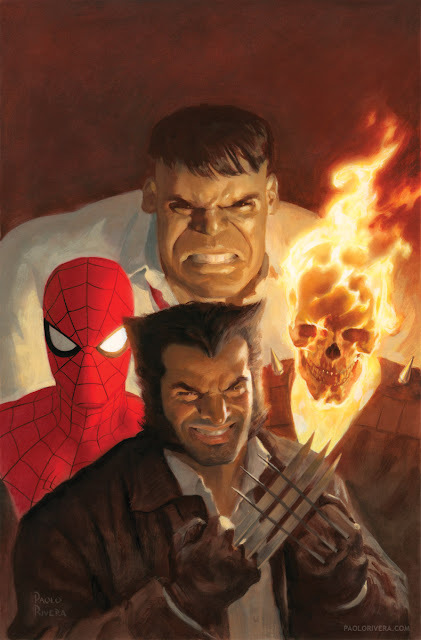 I thought Wacky Reference Wednesdays would be a good way to get back into blogging, so here's the third of four variant covers celebrating the Fantastic Four's 50th anniversary (It'll be on Fear Itself #1). The previous 2 included a 60s-era theme and classic villains. You'll have to wait a while for the last, but let's just say it's "cosmic." Good grief, I am such a nerd. Paolo, you are an incredible inspiration and someone to look up to. Nic, I literally couldn't do it without him.